In 1985 my beloved Grandfather was diagnosed with prostate cancer. Treatment had failed, and he was admitted to hospice care in Syracuse, NY. He died November 16, 1985. The care he received from his hospice team was amazing. I had an overwhelming sense of peace when he died. I vowed that one day I would do hospice work. At the time I was a nurse in the post-anesthesia care unit (PACU). In time I investigated the hospice positions in the area but there were none available. Fast forward to when we moved to North Carolina where I took a job at Rex Hospital. I kept watching The News & Observer want ads for hospice positions. Finally, I went to a job fair at the Holiday Inn. That was my first encounter with Hospice of Wake County. I applied for an on-call nurse position. My first day with Hospice of Wake County was March 1, 1999. That is also when we established the first dedicated on-call team! What keeps me here? There are multiple reasons. First and foremost, hospice care is a calling to me. It is my hope and dream that patients will die peacefully and with dignity, that families will be at peace when their loved one dies. Today, I lead the community-based hospice teams and have the most incredible staff! They are passionate about what they do and deliver excellent care. They make me proud every day. While hospice care has evolved, I still love the challenge of keeping up with the changing times. My favorite story is one I wrote, An Angel Grew Wings. After having been a nurse for over 15 years and primarily working in the surgical suite, I could no longer resist the call to be a hospice nurse. I joined the on-call of Hospice of Wake County in March 1999 as a staff nurse. I continue to work as an on-call nurse as well as being the team leader for the on-call team. Hospice of Wake County is unique in having a dedicated on-call team as opposed to case managers taking call. Being a hospice nurse can sometimes be very stressful. You often wonder if you can dig into your soul to find one more ounce of compassion. However, the rewards outweigh the stress. The story that follows is true and probably one of my most rewarding moments as a hospice nurse. Every Christmas the on-call team gathers for a holiday breakfast. During this time, we tell stories and exchange gifts. This past Christmas was no different. One of my gifts was an angel pin from Elizabeth. [Similar pin shown to the right.] I love angels and believe in angels. The party took place on a Friday morning. The weekend had been steady with patient calls. On Sunday night I received a call to go out and pronounce a patient. I rarely wear jewelry. I never take my wedding rings off but to add jewelry is rare. I don’t even like to wear a watch. But as I was getting dressed to go pronounce the patient, I spotted my new angel pin on my dresser. Something made me pin it to my sweater. I began to wonder how the family will be doing by the time I get to the home. Upon arriving in the patient’s home, I discovered that the woman who died had only one child who was just nine years old. Her name was Julie. Julie was the tiniest little nine-year-old I’d ever seen! She was beautiful and had huge brown eyes. While I tended to the business of the pronouncement, Julie kept close by my side wanting to know everything I was doing. She needed to know what would happen to her mommy. She crawled up on my lap and we quietly talked about what would happen when the funeral home people would arrive. It just didn’t seem right that this little girl’s mommy should die. It was even worse since it was Christmas time. But, my faith in God told me it was His will. Out of something bad good too shall come. While her dad was numb with shock and trying to call family to let them know what happened, we sat in front of the Christmas tree talking. Julie told me how her uncles had decided to decorate the tree. This was a first for them and it was a pretty funny story. She talked openly about her mommy. To see the sadness in her eyes just broke my heart. All the time we sat in front of the tree I kept looking at the angel on top of the tree. 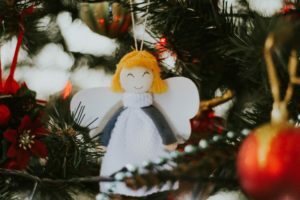 Then it came to me: this child needs an angel of her own. I took the angel from my sweater and pinned it to Julie’s bathrobe. I told her that whenever she wore this angel, she would remember her mommy. Tears flowed from her eyes and mine as well. After a while, she curled up on the couch under a blanket. Every few minutes she would lift the blanket and look at her angel. She thanked me several times for it and proudly showed it to all the family. So, what was a Christmas gift to me turned out to be a gift of hope for a little child. 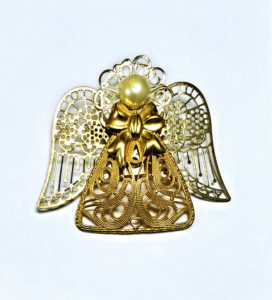 Since this time, I keep a stash of angel pins. Whenever I go out to pronounce a patient, I place an angel on their pillow after the patient has left the home. I never tell the families it is there; I let them discover it on their own in hopes that they will find some comfort. Families have written in and told me how they wore their angel to their loved one’s funeral. The story doesn’t end here. 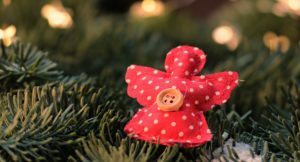 Several months after the death of Julie’s mom, I learned that she proudly told about her angel in her kids’ bereavement group. Even better yet, I happened to be working late in the office one night when the kids’ group was going on. As luck would have it, I got the biggest, best hug from Julie that night. I’m happy to report that she and her dad are doing well.